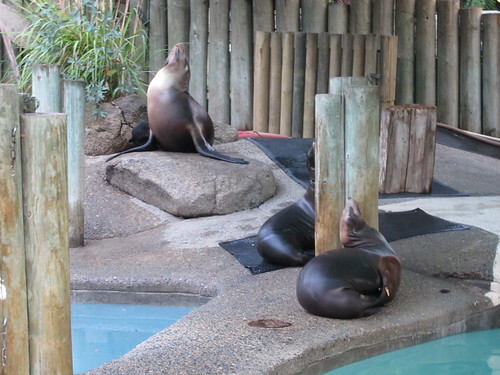 A few weeks ago our zoo hosted a special member’s only event that I had been looking forward to for a month. Of course I was quite crestfallen when the weather predicted rain all week and Saturday morning dawned gray and drizzly. 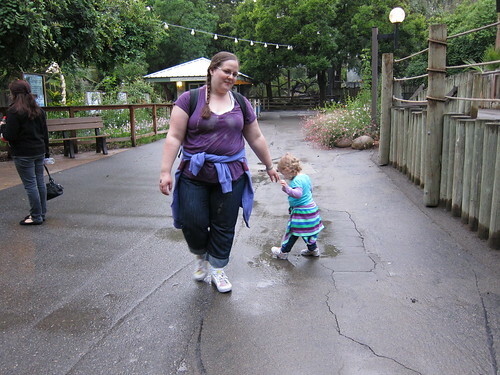 The weather all afternoon was rainy, but it had lightened up by the early evening so we made the decision to chance a downpour and headed to the zoo. I’m so glad that we did, we got to see some really cool behind the scenes stuff, had a couple of really neat chats with keepers and almost had the zoo to ourselves. I didn’t get very many pictures because it was getting dark, and really this was our 5th trip to the zoo this year, so there wasn’t much new to take pictures of. Haha, let me just stop here and say that I got over that last part pretty quickly. I mean really, I love to take pictures, especially pictures of Lily. This is the view of the elephants from the viewing area. 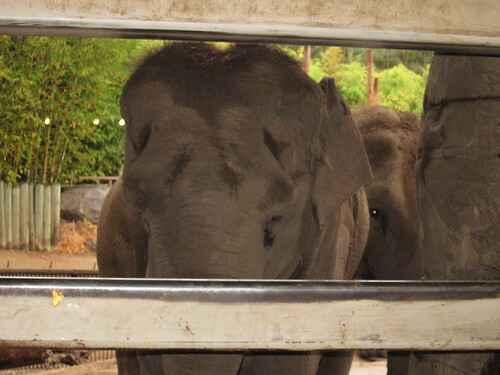 We went inside the elephant house and keepers told us what the different rooms were used for. 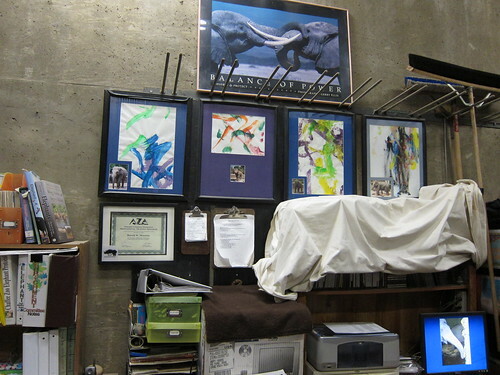 This is the keeper office area and those four paintings were done by our local elephants. I thought that was way cool. I didn’t get any other pictures of the rooms because it was just too dark. It’s pretty neat though, they have the area where they do medical exams and procedures, and training spaces. Sorry for the next couple of pictures. They were taken inside the elephant house, which was dark, but I had to share them anyway. 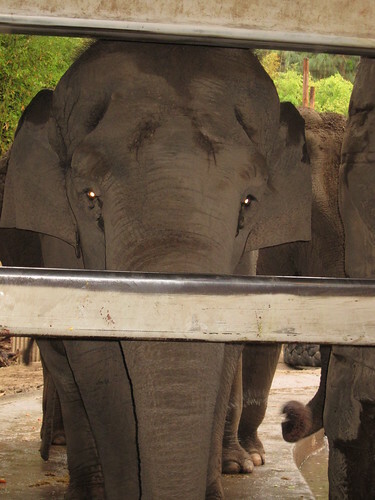 After the little talks with the keepers the kids got to feed the elephants. Lily loved this part! She threw little carrots to the elephants over and over again. 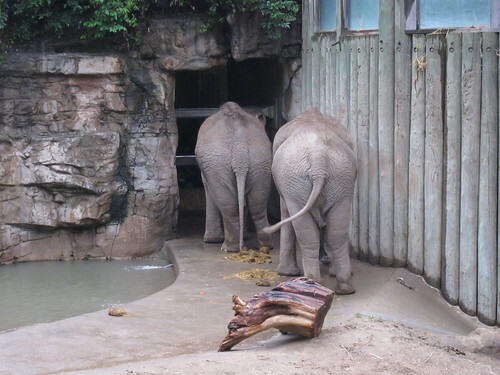 The elephants loved it too. We found out that our elephants are on a diet, so the carrots were a nice treat for them. 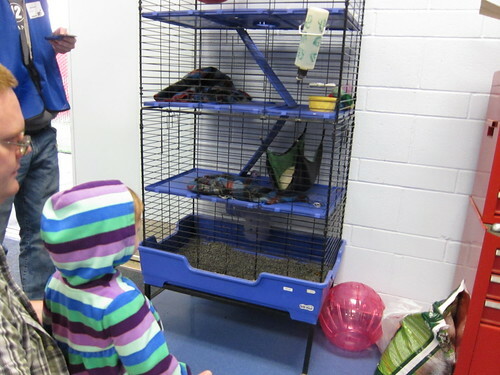 We also got to go inside the animal hospital. Luckily for the animals it was empty tonight except for one lonely ferret, who is now retired from the zoo’s mobile zoo truck. 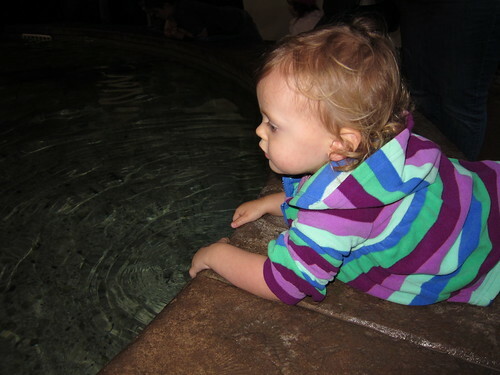 We went into the Sting Ray Bay Exhibit for the first time. 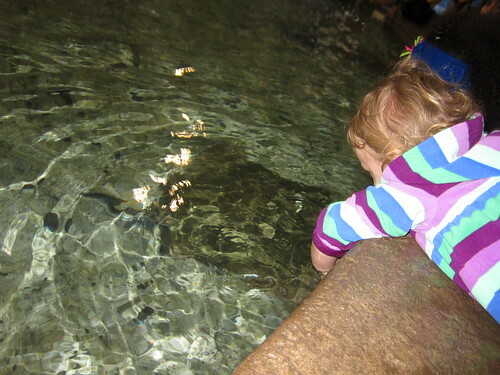 You can try to pet the stingrays, but Lily was just too short to reach any. She loved trying though. "come here ray, come here"
While we were visiting the Orangutans we got to chat with a keeper who was wearing this really weird, brown, string covered shirt. She told us all about how one of the new Mom Orangutans was 41 years old and this was her 4th baby and the keepers were determined that she would get to raise this baby herself as they know it will be her last. When she had her first baby it was 20 years ago and her milk wouldn’t come in so the baby died, the Keeper made sure to explain that she wasn’t at this zoo till this last baby and zoo’s didn’t know how to help as much back then. For her next two babies, again her milk didn’t come in so keepers raised the babies. When the Orangutan (I didn’t catch her name, I really wish I had) got pregnant again, the keepers at our zoo were going to make sure that she succeeded. For the first two months of the baby’s life the keepers took care of it, but also helped the Mom to stay connected to the baby. The keepers wore that crazy shirt so the baby would get used to hanging on like they do with their real Mom, the keepers wore face masks (think doctor type mask) so the baby wouldn’t imprint on a human, and the keepers slept on a cot two feet from the Mom’s cage so the Mom could reach out and touch the baby at night. The most impressive part (as if that wasn’t impressive enough) was that a keeper pumped the Mom every two hours around the clock to help her milk come in. I know I had a hard time pumping, I can only imagine how hard it must have been to pump a Orangutan. All their hard work paid off because from the time the baby was two months old she has been under her Mom’s constant care and no longer needs the keepers. I was so moved by this story, the keepers hard work and determination to make sure a mother and her baby would have the best chance at life, no matter what species they are, is just amazing. I commented to the keepers as we were moving on that I find it fascinating that breastfeeding can be a challenge to animals just like it can for humans. Waldo took this picture because he thought it was very cute that Lily and I both had hoodies wrapped around us. Not the most flattering picture of me, but that's ok. 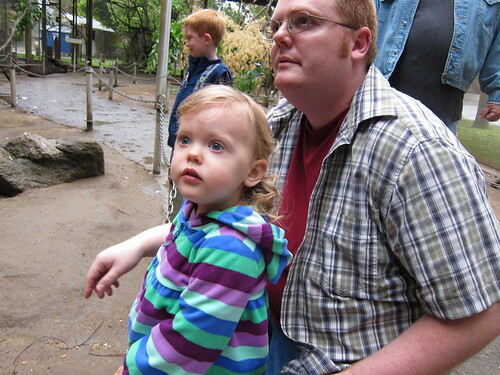 This event was one of the reasons I became a zoo member. I loved getting to see behind the scenes.